Humanity's most complex ground-based astronomy observatory, the Atacama Large Millimeter/submillimeter Array (ALMA), has officially opened for astronomers. The first released image, from a telescope still under construction, reveals a view of the Universe that cannot be seen at all by visible-light and infrared telescopes. Thousands of scientists from around the world have competed to be among the first few researchers to explore some of the darkest, coldest, furthest, and most hidden secrets of the cosmos with this new astronomical tool. 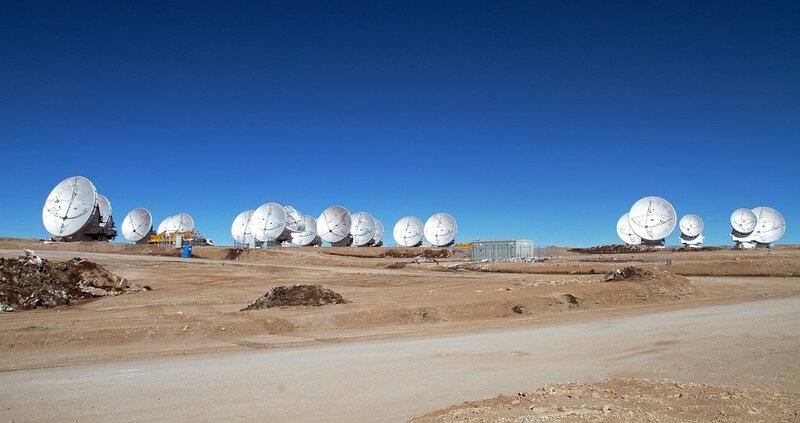 At present, around a third of ALMA’s eventual 66 radio antennas, with separations up to only 125 metres rather than the maximum 16 kilometres, make up the growing array on the Chajnantor plateau in northern Chile, at an elevation of 5000 metres. And yet, even under construction, ALMA has become the best telescope of its kind — as reflected by the extraordinary number of astronomers who requested time to observe with ALMA. “Even in this very early phase ALMA already outperforms all other submillimetre arrays. Reaching this milestone is a tribute to the impressive efforts of the many scientists and engineers in the ALMA partner regions around the world who made it possible,” said Tim de Zeeuw, Director General of ESO, the European partner in ALMA. ALMA observes the Universe in light with millimetre and submillimetre wavelengths, roughly one thousand times longer than visible-light wavelengths. Using these longer wavelengths allows astronomers to study extremely cold objects in space — such as the dense clouds of cosmic dust and gas from which stars and planets form — as well as very distant objects in the early Universe. ALMA is radically different from visible-light and infrared telescopes. It is an array of linked antennas acting as a single giant telescope, and it detects much longer wavelengths than those of visible light. 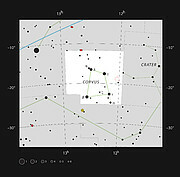 Its images therefore look quite unlike more familiar pictures of the cosmos. The ALMA team has been busy testing the observatory’s systems over the past few months, in preparation for the first round of scientific observations, known as Early Science. One outcome of their tests is the first image published from ALMA, albeit from what is still very much a growing telescope. 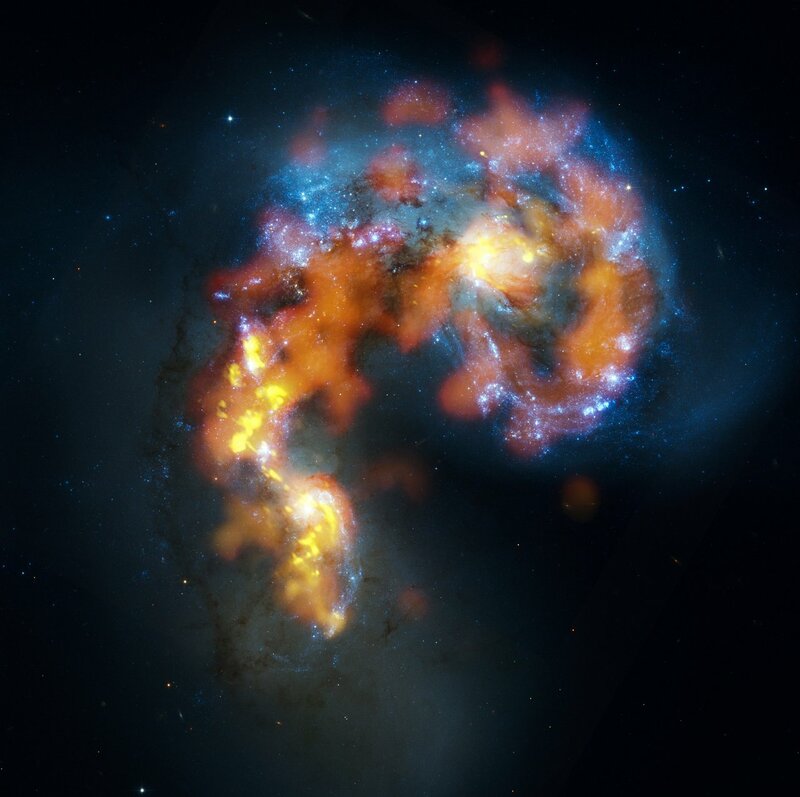 Most of the observations used to create this image of the Antennae Galaxies were made using only twelve antennas working together — far fewer than will be used for the first science observations — and with the antennas much closer together as well. Both of these factors make the new image just a taster of what is to come. As the observatory grows, the sharpness, efficiency, and quality of its observations will increase dramatically as more antennas become available and the array grows in size . 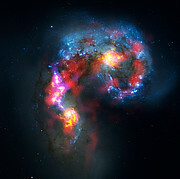 The Antennae Galaxies are a pair of colliding galaxies with dramatically distorted shapes. While visible light shows us the stars in the galaxies, ALMA’s view reveals something that cannot be seen in visible light: the clouds of dense cold gas from which new stars form . This is the best submillimetre-wavelength image ever made of the Antennae Galaxies. Massive concentrations of gas are found not only in the hearts of the two galaxies but also in the chaotic region where they are colliding. Here, the total amount of gas is billions of times the mass of our Sun — a rich reservoir of material for future generations of stars. Observations like these open a new window on the submillimetre Universe and will be vital in helping us understand how galaxy collisions can trigger the birth of new stars. 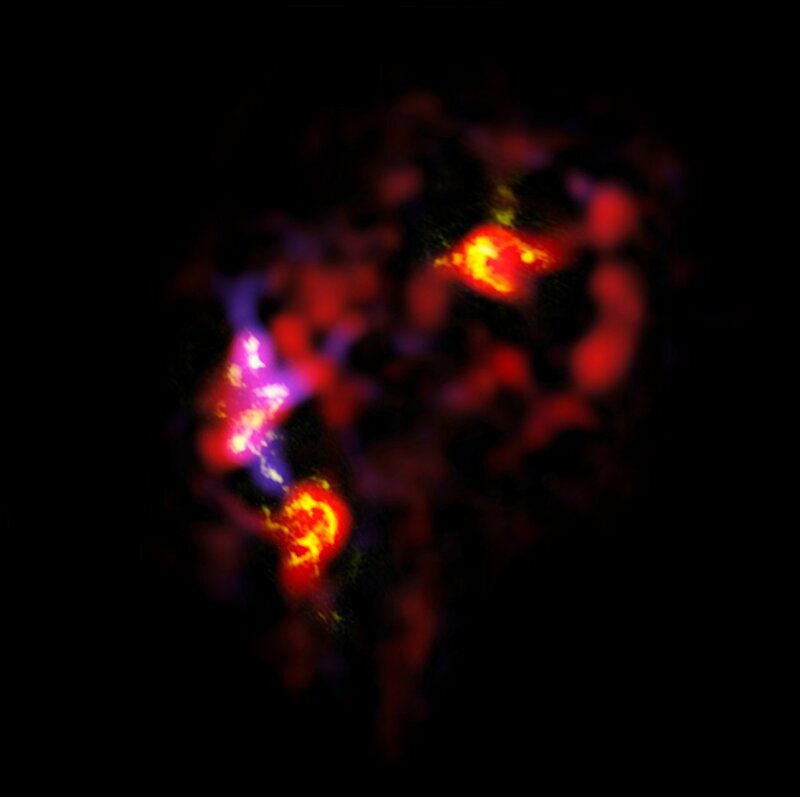 This is just one example of how ALMA reveals parts of the Universe that cannot be seen with visible-light and infrared telescopes. ALMA could accept only about a hundred or so projects for this first nine-month phase of Early Science. Nevertheless, over the last few months, keen astronomers from around the world have submitted over 900 proposals for observations. This ninefold level of oversubscription is a record for a telescope. 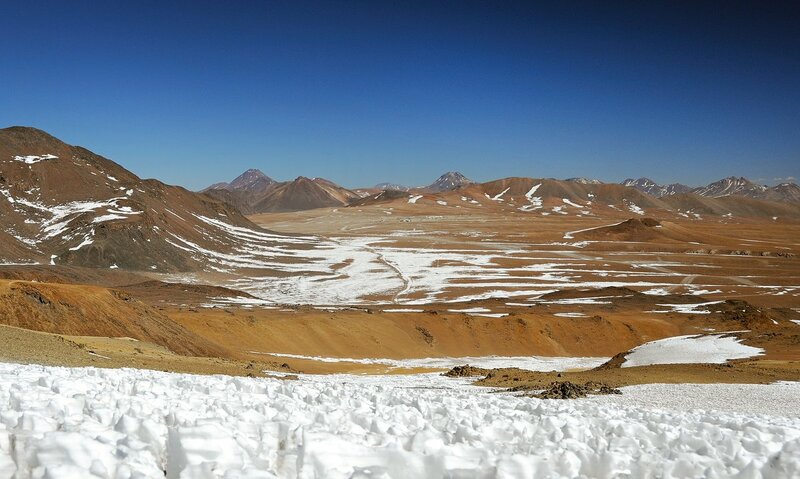 The successful projects were chosen based on their scientific merit, their regional diversity, and also their relevance to ALMA’s major science goals. "We are living in a historic moment for science and particularly for astronomy, and perhaps also for the evolution of humanity, because we start to use the greatest observatory under construction at the moment," said Thijs de Graauw, Director of ALMA. His team’s target is AU Microscopii, a star 33 light-years away that is only 1% of the age of our Sun. “We will use ALMA to image the ‘birth ring’ of planetesimals that we believe orbits this young star. 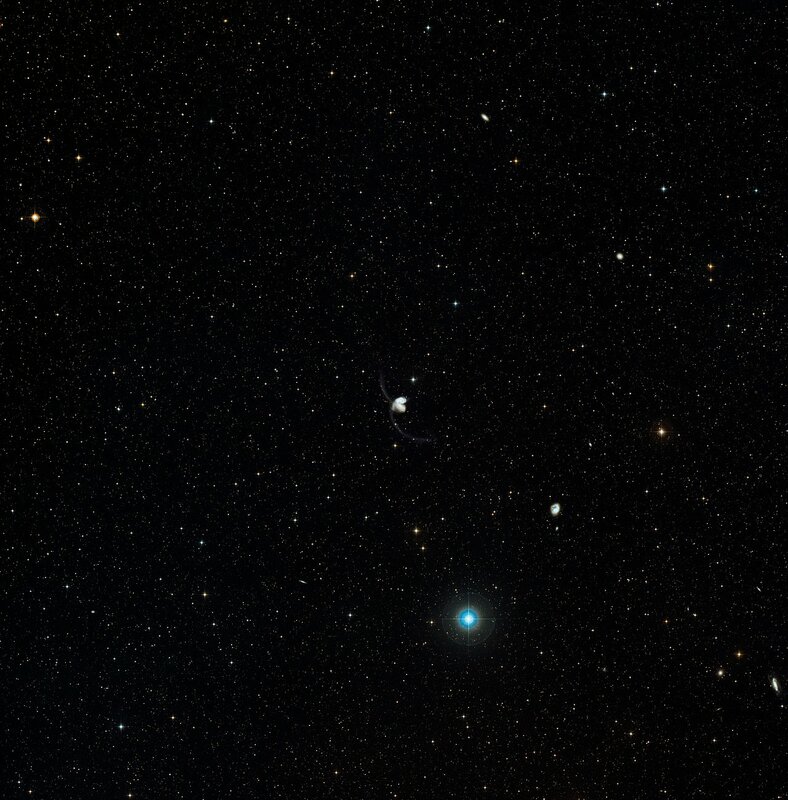 Only with ALMA, however, can we hope to discover clumps in these dusty asteroid belts, which can be the markers of unseen planets.” Wilner and his team will share their data with a European team who also requested ALMA observations of this nearby, dust-ringed star. Any hunt for habitable planets around other stars often begins with a hunt for water in those distant solar systems. Debris discs, the swarms of dust, gas, and rocks around stars, are suspected also to contain craggy ice chunks filled with frozen water, gas, and possibly even organic molecules — the astrochemistry of life. Simon Casassus, from the University of Chile, and his team will use ALMA to observe the gas and dust disc around HD142527, a young star that is 400 light-years away. 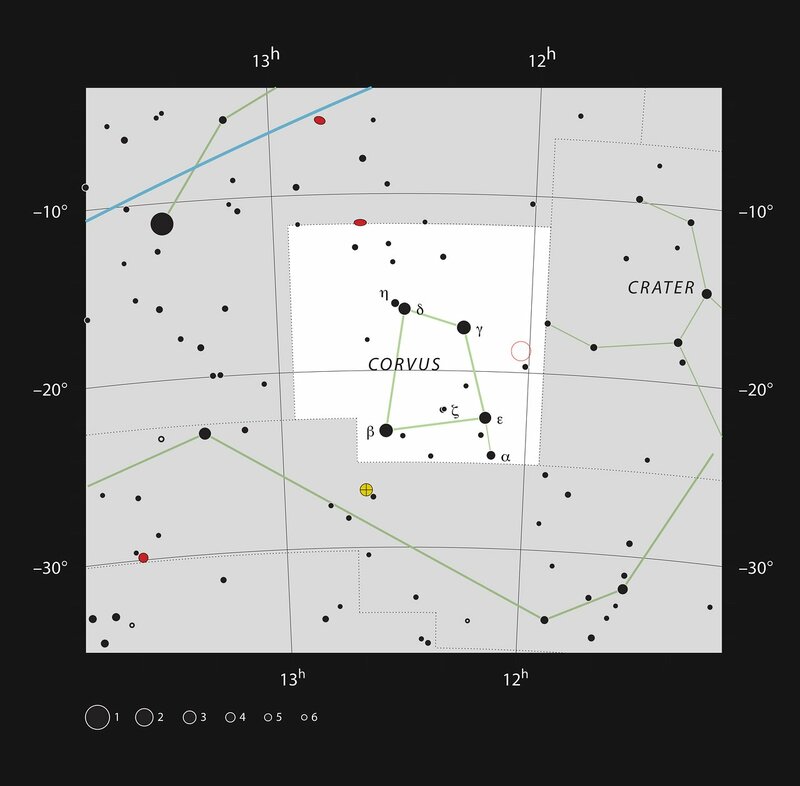 “The dusty disc around this star has a very large gap, which may have been carved by the formation of giant planets,” said Casassus. “Outside the gap, this disc contains enough gas to make about a dozen Jupiter-sized planets. Inside the gap, a young gaseous giant planet could still be forming, if there is gaseous material available.” Their ALMA observations will measure the mass and physical conditions of gas interior to the gap. “Thus, ALMA gives us a chance to observe planet formation, or its most recent wake,” said Casassus. Further away, 26 000 light-years from us in the centre of our galaxy, sits Sagittarius A*, a supermassive black hole four million times the mass of our Sun. 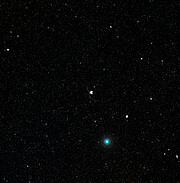 Gas and dust between it and us hide it from our optical telescopes. However, ALMA is tuned to see through the galactic murk and give us tantalising views of Sagittarius A*. Like the black outlines in a child’s colouring book, cosmic dust and cold gas trace out structures inside galaxies, even if we can’t see those galaxies clearly. At the outer fringes of our visible Universe lie the mysterious starburst galaxies, bright islands in an otherwise calm, dark cosmos. ALMA will hunt for cold gas and dust tracers here, as far back as a few hundred million years after the Big Bang, at a time astronomers call “cosmic dawn”. During its Early Science observations, ALMA will continue its construction phase in the Chilean Andes, high on the remote Chajnantor Plain in the harsh Atacama Desert. Each new, climate-armoured antenna will join the array and be linked via fibre optic cabling. The views from each distant antenna are assembled into one large view by one of the world’s fastest special-purpose supercomputers, the ALMA correlator, which can perform 17 quadrillion  operations per second. By 2013, ALMA will be an up to 16-km wide array of 66 ultra-precision millimetre/submillimetre wave radio antennas working together as one telescope and built by ALMA’s multinational partners in Europe, North America and East Asia. 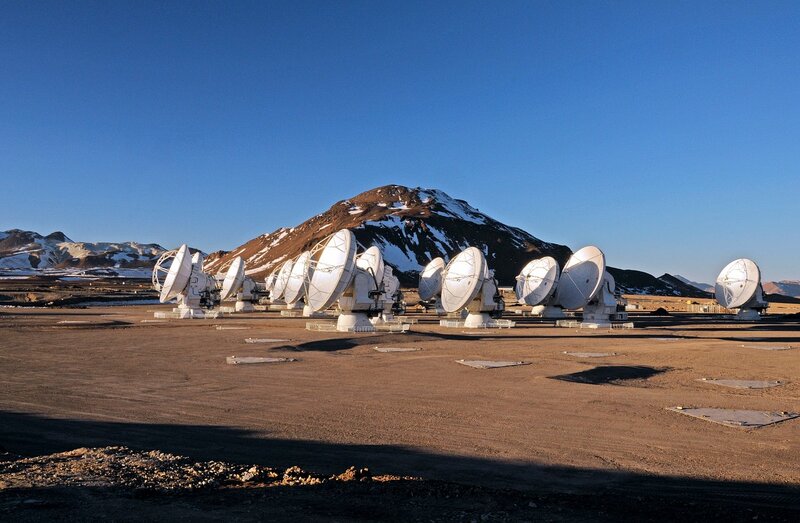 The Atacama Large Millimeter/submillimeter Array (ALMA), an international astronomy facility, is a partnership of Europe, North America and East Asia in cooperation with the Republic of Chile. ALMA is funded in Europe by the European Southern Observatory (ESO), in North America by the U.S. National Science Foundation (NSF) in cooperation with the National Research Council of Canada (NRC) and the National Science Council of Taiwan (NSC) and in East Asia by the National Institutes of Natural Sciences (NINS) of Japan in cooperation with the Academia Sinica (AS) in Taiwan. ALMA construction and operations are led on behalf of Europe by ESO, on behalf of North America by the National Radio Astronomy Observatory (NRAO), which is managed by Associated Universities, Inc. (AUI) and on behalf of East Asia by the National Astronomical Observatory of Japan (NAOJ). The Joint ALMA Observatory (JAO) provides the unified leadership and management of the construction, commissioning and operation of ALMA. The quality of images from an interferometric telescope like ALMA depends on both the separations and the number of the antennas. Larger separations mean that sharper images can be created and if more antennas are working together more detailed images can be produced. More information about ALMA and interferometry can be found at: http://www.eso.org/public/teles-instr/alma/interferometry.html. The observations were made at specific wavelengths of millimetre and submillimetre light, tuned to detect carbon monoxide molecules in the otherwise invisible hydrogen clouds, where new stars are forming.